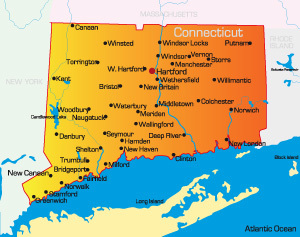 Connecticut is the southernmost state in New England and is home to 3,500,000 people. It is known by several names including The Nutmeg State and The Constitution State. The state is bordered by New York and Massachusetts. The capital city is Hartford with a population of nearly 130,000 residents. Interstate highways are the major modes of transportation and some of the busiest are I-95 (Connecticut Turnpike), I-84, I-91, and I-395. Other large transportation venues are Bradley International Airport and Danbury Municipal Airport. Many universities reside within the state such as the prestigious Yale University, University of Connecticut (UConn) and Trinity College. One of the biggest attractions in the state is ÒThe GameÓ between Harvard and Yale taking place in YaleÕs football stadium.